Greetings! My name is Arianna and I am the founder of White Rabbit Productions and creator of four oracle decks: The White Rabbit Oracle, Oracle of Shadows, the Victorian Gothic Lenormand and the White Rabbit Lenormand. I am currently working on a tarot deck - White Rabbit Tarot. I am an intuitive counselor and visionary artist who has studied and worked with Tarot for over 20 years and have made it my full-time profession. I have been fascinated and involved with spiritual pursuits since childhood and have studied in various fields, including alternative healing modalities, parapsychology, and Buddhist psychology and practice. I have also studied and created art all of my life and found my calling combining the visionary and spiritual with the artistic. 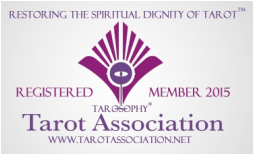 I am a member of the Tarosophy Tarot Association and have studied tarot with a number of teachers including best-selling Tarot author Josephine Ellershaw, James Wells, and other distinguished Tarot professionals. I continue to study the vast field of Tarot every day through my own research and reading, as well as through Master-level in-person and on-line webinars. A consultation with me is insightful and powerful; to each I bring my extensive knowledge of Tarot, my natural intuitive and spiritual talents, and more than twenty years of serious study and experience. I strive to bring compassion, humor, and a positive message to each reading and I perform every reading with respect for each person's spiritual orientation, lifestyle choices and cultural perspective. I also will integrate my own White Rabbit Oracle deck with the tarot for a deeper dimension. I have read Tarot for many people in-person, by phone, and through email and have received consistently positive reviews. My work as a visual artist complements my passion and fascination with Tarot. Tarot is a rich and fascinating gateway and tool to tap into innate intuition, deeper knowing, and psychic abilities; it is a system of symbols, of universal archetypes, of ideas from deep in our psyches that have existed since the beginning of human civilization. Art expression too comes from a deeper consciousness, and my own oracle decks reflect this, the magical images emerging from the same depths as my intuitive Tarot knowledge. A tarot consultation is a map to show you where you're heading and each card is a signpost on life's highway. It is my role to help you chart a course and understand the exit signs along the way, to make informed decisions and proceed with more confidence. I may also offer suggestions at the end of your reading to assist you energetically, such as the use of specific stones and/or crystals, meditations, colored candles, and other aides. I am available for in-person readings in the immediate San Francisco Bay Area, as well as by email or Skype internationally. I also provide fun, fresh and interactive entertainment for private parties. Visit my Services page for more information and rates - I look forward to exploring Tarot with you! Questions? - Contact me. By the way – I call my practice White Rabbit Productions (as well as two of my oracle decks) because it was the White Rabbit who led Alice down the rabbit hole after all – and Tarot is that rabbit! The White Rabbit also once came to me in a dream which I've never forgotten, urging me to follow him and don't be late - so I did!